Enlarged view of one tete-beche pair of the S. Korean issue celebrating IYA2009. 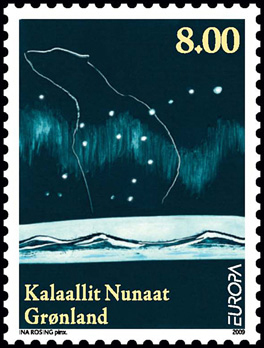 The left stamp depicts the Whirlpool Galaxy M51 and the right stamp depicts the Planetary Nebula NGC 3132.Spanning the two images are diagrams of constellations that are highlighted against the document or device that they originate from. 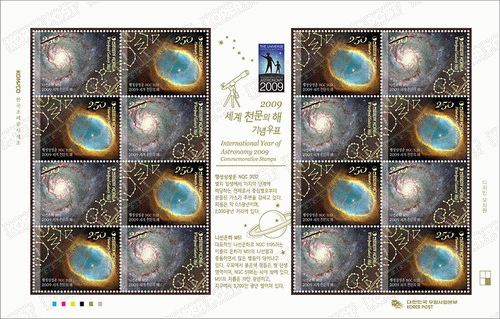 This sheet from S. Korea illustrates many aspects of philately that can be combined intoa single format. The sheet is known as a souvenir sheet. It carries text and illustrations within the selvage of the sheet that provide a wealth of information such as: the sheets position on the plate that was used to print it, information about the printer, color key to the inks used, even the IYA2009 logo and it is not unusual for there also to be serial numbers. the two groups of stamps surrounded by the selvage are oriented so as to be shifted in position from its neighbor. 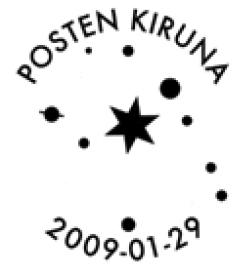 Post Greenland Europa 2009 ~ Astronomy issue: "The theme of this year's EUROPA-issue is astronomy. 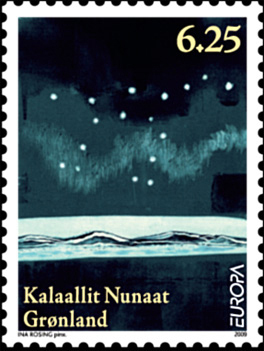 Ina Rosing has created our two beautiful stamps, which captures the very unique Greenlandic approach to astronomy. They are issued in regular whole sheets, mini sheets and in a stamp booklet as self-adhesive stamps." courtesy Greenland Collector. Enlarged view of the 6.25 valued issue from Greenland. Enlarged view of the 8.00 value from Greenland. First Day Cover of the 8.00 value with block of four stamps, special cancel and appropriate cache art. The special cancel used for the FDCs of the Greenland issues. 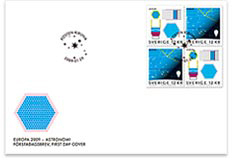 Posten AB Europa 2009 ~ Astronomy issue: "Stamp book of four stamps (48 KR) with two each of two designs. 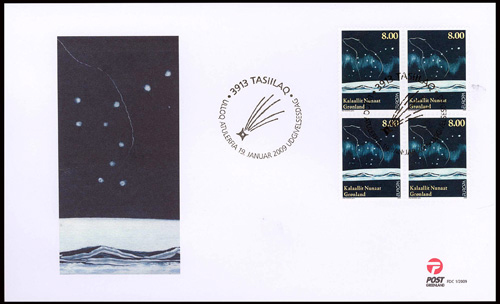 Special postmark used on first day cover (with related cache art) and CTO. Also available is a collector sheet. Designs related to instrument used for X-ray research of Crab Nebula. Image of a First Day Cover with the special cancel, a block of four of the stamps and cache art. A pair of stamps showing the two designs. The left-hand design highlights the target of the mission and displays the balloon that carries the instrument aloft to escape the distortions of Earth's atmosphere. The stamp on the right features schematics of the instrument used to collect the data. Both designs celebrate the instrument which is used for X-ray research of the Crab Nebula.